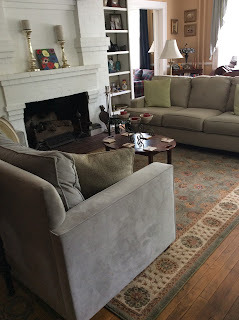 Abbington Green Bed & Breakfast Inn, Asheville NC: Nick's Notes 7.3.2015-It's 5 o'clock at Abbington Green! Nick's Notes 7.3.2015-It's 5 o'clock at Abbington Green! It's 5 o'clock at Abbington Green! Years ago I purchased this beautiful antique marble top table that I loved. It's moved around with me to several states........Illinois, Florida and now North Carolina. Movers never enjoyed moving it based on the weight and the fragile marble. Our beautiful table now has a purpose and prominent location in the living room. This is now where we set up our 5 o'clock Social Hour each day. As Steve and I planned out purchasing an Inn, we knew we would have a social hour daily for guests to mingle together and for them to get to know us too. The tradition started Day 1 when we moved in on September 30th, 2014. We closed on the property at 9 AM and when 5 o'clock rolled around there was wine and cheese for our guests...............and the moving truck still in the driveway unloading. 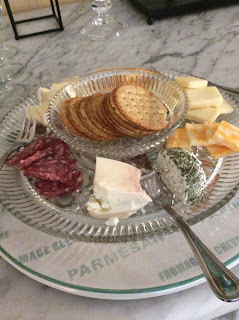 Our social hour consist of local NC Cheeses from the Western North Carolina Cheese Trail, Hot Appetizers, and Wines. Our themes change daily from Southern Foods, Italian favorites, and yes, Greek Mezedes. On Greek night, it brings back memories of when my parents entertained at our house. Fresh baked Spanakopita (Spinach Pies), Hummus and Pita Bread, and Dolmades (stuffed Grape Leaves). Guests continue to comment on Trip Advisor how much they love our 5 o'clock Social Hour. It gives them the opportunity to share with others what they did for the day in Asheville, where they are going for dinner, and to get to know each other and us. Lady "Amber" Abbington occasionally makes a guest appearance when guests want to meet her too. She always appreciates the extra attention! One of the reason people come to a Bed and Breakfast versus a Hotel is exactly what takes place at social hour........having that interaction with other guests and the owners. We are so fortunate to have a very large living room with two sofas and chairs for guests, with a large fireplace for the winter months. During the spring, summer and fall the porches get a lot of use during social hour. Guests love taking in the mountain view and feel the cool breezes. I love this part of my day and enjoy spending time with guests! They continue to enrich the wonderful memories I treasure so much!